Latin Mass Youth Choir…in Las Vegas! OU PROBABLY would not think of Las Vegas as anything more than “Sin City.” It is not a place that conjures up thoughts of God as much as it does of the devil. And in many ways, it is a spiritual desert. But there is much more to the city that lies beneath the surface of the glittering lights and clanging slot machines. Like any desert, there is a refreshing oasis in Las Vegas. That oasis is our parish, St. Bridget Catholic Church, where we celebrate the Traditional Latin Mass every Sunday at 10am. Here, you will find a cool oasis to drink from. At this Mass, I run a small Schola comprised mainly of children and teens, with a few adult men who provide tenor and bass parts. For a long time all we had were the teens. But I knew that if our Mass was to survive in the long term, we needed more. Some people thought I was being ridiculous when I said I wanted to have the younger kids at our Mass start singing. We already had our small teen Schola, which grew out of a need for someone to lead the music at our then-Novus Ordo Mass (in Latin). They started from scratch, beginning with the most basic chants of the Church found in the JUBILATE DEO. They were doing great and had grown a lot, musically speaking, from those first days when the future of our Latin Mass seemed unstable. The youngest of the new group I wanted to form was 7 years old. Father did not think it was a very good idea, not only because he thought they were too young, but also because I am a homeschooling mom of 6 kids including 10 month old twins. Father knew that my time and energy was very limited. I am in that phase of my life where all my energy and attention are poured out into my children. All my energy, that is, except for the little bit that I reserve for my 7th baby: Music. Of course, Father was right—this would be quite a sacrifice in addition to the weekly rehearsals we already had for our teen Schola. However, this is not something I had to do alone. I have a marvelous husband who is very supportive of my musical endeavors. And fortunately, I have a group of dedicated Schola moms who are also very supportive. They take on the role of watching my numerous littles while I run rehearsals. Without them, this could not, and would not, happen. But the sacrifice was not mine alone. Our Mass is small. Our resources are nothing. An absolute, dead zero. Whenever we need something—sheet music, red missals, and so on—the families who attend the Mass shell out extra money outside of their regular tithe to make it happen. This is how our teens were able to attend the CCWatershed Symposium this past June. Not only did CCWatershed generously offer them much needed scholarships, but the families at our Mass also donated generously to help cover the cost of travel and accommodations. Because I am stubborn, musically ambitious, and secure in the unconditional support I have from the other Schola moms, I decided to forge ahead with our “mini Schola.” Now, I should tell you one important detail about myself. I am not a professional musician. I have no music degree, no professional experience, and have never been trained to conduct or run a choir. I am a busy stay-at-home mom. But what I lack in professional training, I make up for in zeal. I desire to glorify the Lord through music. I am a firm believer that anyone can learn to sing, even very little children. And on a practical level, I knew that as our teen Schola gets older and they start leaving for college and work I would soon be left without singers. It was imperative that we start training new singers to come up the ranks. Today, just 18 months after they started, the mini Schola is practicing diligently to learn the full Introit for Christmas Day Mass. This is the first time the mini Schola will be joining the teen Schola in chanting a full Introit! It is a major milestone in the life of the mini Schola. 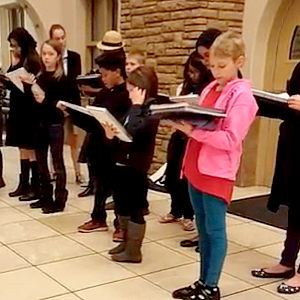 Three of our minis will be singing the first half of the psalm verses, as you can hear in the video clip. I am very happy with how they sound. They have worked very hard. I know that on Christmas Day, here in “Sin City,” they will glorify the Lord with their angelic voices. The sacrifices are well worth it. So why am I sharing all this with you? To give you a message of hope. If you have a humble, small Latin Mass without resources and professional music directors, please know that you are not alone. There are others of us out there with similar challenges. We may not have money, degrees or resources, but do you know what we have? We have the virtue of zeal. Because of that one very important virtue, having beautiful music at Mass is within your grasp. Between your zeal and the excellent musical resources provided for free on CCWatershed, you are not merely eking out your musical existence in a feeble attempt to build up the beauty and reverence of your Mass. You are absolutely, utterly unstoppable.